Whether converted from a cannery built before Alaska’s statehood, or a custom designed and built facility constructed for this specific purpose, fishing lodges in Southeast Alaska are as unique as they are remote. 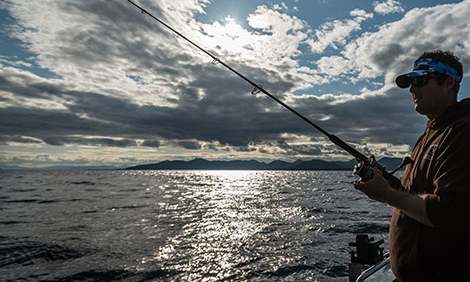 Any wilderness fishing lodge in Southeast Alaska worth its salt can rightfully claim world-class saltwater fishing. You can plan on spending your days pulling in multiple Pacific salmon species, halibut, snapper, and lingcod whichever lodge you select. The difference is in the peripheral offerings; probability of whale sightings, freshwater fishing availability, evening lodge amenities, fishing vessel quality, and proximity to civilization are just some examples of considerations that set one lodge apart from the next. On this page you’ll find the best fishing lodges Southeast Alaska has to offer, as experienced by the Slagle family, with special attention given to what makes each lodge unique amongst its peers. Yes Bay Lodge, like several upscale resorts and lodges in the area, is a converted salmon cannery renovated to serve sportfishing and wilderness enthusiasts. The Hack family purchased the lodge in 1976, and is now in its third generation of operation. Kevin Hack and Chuck Slagle both started their careers working in the Ketchikan seaplane industry in the 1970s. As friends of the family, Baranof recommends spending a few days at this wilderness resort for anyone looking for excellent freshwater fishing or just some time off the grid. Visitors to our area will enjoy combining salmon and bottom fishing out of Ketchikan during the days and exploring our frontier town at night for the first half of the week, then hopping on a bush plane out to the Bay for a few luxurious days in the wilderness fly fishing for steelhead & rainbow, dolly varden, and cutthroat trout, as well as sockeye salmon. Although the fishing is excellent in both Ketchikan and Yes Bay, being able to sample a wilderness lodge experience and enjoy the rich culture of Ketchikan is a popular combination of Alaskan experiences.